Our culture loves comfort. It’s not a secret. We love drive-thrus, and air conditioning, and convenience. But we don’t just love comfort, we’re obsessed with it to the point that we decided blankets aren’t quite comfortable enough and we had to invent the Snuggie. And this love affair with comfort carries over into our spiritual life. We don’t want to talk about the Cross. It makes us uncomfortable. We want to feel good about ourselves. We want therapeutic Christianity. But that’s not what Christ is offering us. I hate being sick. I am the world’s biggest whiner even when all I have is a cold. So, you can imagine how fun I am to live with when I’m pregnant and experiencing months of morning sickness—can’t-keep-water-down and can’t-get out-of-bed morning sickness. I hate being uncomfortable. I hate struggling through those weeks. And that quote hit me right between the eyes. And if we’re blessed with a future pregnancy, I want those words framed above my toilet so that every time I’m sick I can remember the truth of it and try to hold it in my heart. That God would be using me to knit together a new little soul. Another little heart for Him to dwell in and be his throne. He offers us a chance to participate in his work, and the work He desires to do in us is not comfortable, but it is great. I think about Pope Benedict’s quote almost every day. When I’m tired from all the night feedings–you were not made for comfort. When I’m caring for sick little ones–you were not made for comfort. When the daily tasks of motherhood leave me mentally and physically exhausted–you were not made for comfort. I think about the great and uncomfortable work I have been given to do– nourishing the bodies and minds of my children, participating as a co-creator of life, learning to love my family, learning to love my Lord. I think about the discomfort of being honest with myself, learning to examine my heart and really see my sin instead of lying to myself about it. It’s all so terribly uncomfortable, because it requires me to sacrifice my own desires. It’s painful. But this is why God made me. So that I could decrease and Christ in me could increase. So that I could discover who I really am. God has created each of us for greatness in a special way—not success, not comfort, but greatness. And what He sees as greatness will likely be painful and uncomfortable. But it isn’t false or superficial. It isn’t what the world offers us. And Christ models it for us: his Love for us is great, which is why He has suffered so. In his Incarnation, he took on all the discomfort of humanity so that we could know him intimately and walk beside Him. In his Passion, He suffered unbearable agony to pay our debts. In the Blessed Sacrament, He reveals himself again and again so that He can nourish us with his grace. Sorrow and Love. Christ warns us that we will suffer. I try to avoid discomfort at all costs, so you can only imagine how much real suffering frightens me. But He also says “My yoke is easy and my burden is light.” I don’t pretend to really understand that, but sometimes I wonder if we leave our obsession with comfort behind and say “let it be to me according to your will” if we will find his yoke to be light because He carries it for us. This is what I love about having adult children. I taught them when they were little. Now they are teaching me. What a blessing. I will ponder this entry a long time. I have children like that, too. It’s wonderful to hear from Haley’s mom! This is a great post! I have struggled with communicating how I feel about ” feel good” priests. When the homilies center around making sure everyone feels good when they leave. I want to feel challenged , not placated. I want to hear the rough issues and how as Catholics we are to live them. Thanks for putting this out there. It gives me new hope! Agreed Wanda…we miss the priest we left when we moved states because he was a great homilist and challenger! I love this article for the same reasons,..we HAVE to step outside of our comfort zones daily if we want to follow Christ….not easy, but SO worth it, esp. In being open to Gods plan for our families. Thank you Haley for writing this….you put into words what’s been stuck in my brain 🙂 but eloquently. This is the first blog post I’ve read of yours. It’s so beautifully written and full of so much honesty and wisdom. I’m now headed back in time to read more of your blog. Thank you for reminding me of something that I forget far too often. Thank you! That’s so kind. I’m glad you stopped by. Wow, talk about a smack between the eyes! I was literally, just 5 minutes ago filling with sadness because of the THOUGHT of a potential discomfort in my upcoming life. Thank you, Haley for your beautiful words and inspiration to keep my eyes and heart on The Cross! Love all your post but this one was especially poignant – thanks for the always needed reminder of why we are truly here. Whenever im whining or looking for sympathy my Dad (with words passed on from my grandmother) always asks, “who told you this life was supposed to be easy”. Those words, as yours did, remind me that there is more to life than being comfortable. My husband and I recently went through a miscarriage at 16 weeks – the grief and loss is oh so uncomfortable to carry in our hearts as life goes on as it did before we were pregnant. But it is a cross I will always carry and I hope it remains with me as I know that, God enabling, the burden of that discomfort will eventually turn into strength. Thanks for your words. Oh Jennifer, I’m so sorry that you lost your baby. Sending prayers and love for your family and your grieving hearts! This very uncomfortable (and whiny) 9-months-pregnant-for-the-third-time mom needed to read this. I’ve really been enjoying your blog, thank you for your heartfelt and humble wisdom! I’m not a momma yet, but this is so applicable to my life. Thank you for sharing. I needed these words. Thanks for sharing that, Sherral! Thank you for this. This truth has come alive for me since losing our son thirteen months ago. The flip side is quite dangerous: if one does not have a comfortable life, one is doing something wrong/not praying hard enough/doesn’t really love God, etc. Ironically, knowing we were not made for comfort brings…comfort. Hi Shauna, this is definitely a struggle– finding sanctification through suffering. I think the only way is to pray with intent and Our Lord will give you the motivation to understand the good that can come from the suffering. I believe that everything that happens to us is permitted for a reason that will bring us closer to Him. Cling to the inspiration you receive as a result of prayer and when you are down, if all you can do is pray to believe that reason given to you, just do it, again and again. You will emerge on the other side and experience joy. Shauna, I went over to your blog and read about losing Weston. I am so sorry. Thank you for sharing that thought. Very wise and true. I find that the words “yolk is easy, burden light” are very clear after I have emerged from a purgative time and encounter the unhappiness I would currently have if I hadn’t cooperated with Our Lord when he burnt that imperfection from my soul. In other words, tough love from Our Lord makes life lighter, better, freer. Every step we get closer to the Beatific Vision creates greater joy of the heart. The only way this can happen is through the Cross, the same way Our Lord gave it to us. Needed that this morning! Thank you for sharing your thoughts. I’m currently 8 weeks pregnant with our third child. I so desperately needed this post this morning. Thank you! Prayers for a healthy and easy pregnancy, Cassidy! Are you sick? Wow. I what a great quote, and what a great message! I think that today’s Christians are falling into a trap of wanting to be comfortable in terms of ministry. Sure, we like the idea of reaching out to the marginalized, but actually doing it? Well, that’s unfamiliar and scary… so I must not be called to that. We like the idea of protecting our minds and our hearts, but we also really like that funny (although terribly unholy) TV show that’s on every Thursday… so we don’t change our Thursday routine. Yeah, that friend and sister in faith may bash her husband waaay too much, but correcting her in love? Uncomfortable. Another beautiful post Haley! This is one of the best quotes I have heard in a long time. I think this needs to be the motherhood motto. Since I became a mother my life definitely became less comfortable but also so much greater. Things are particularly hectic right now and this was just the reminder I needed to keep me pushing through. Thank you! Thank you for writing this!! We have relied too much on comfort that it becomes a “necessity” in our lives. If I have to stand in line for more than 5 minutes I am already looking at my watch at how this is ruining my day. I should try to use that time for prayer instead of complaining, since I always seem to find no time for that. I also see what you see in our comfort for Jesus. We don’t want to think of the gruesome or uncomfortable. We want to see the “Jesus loves you” with flowers all around it. We can easily be deceived by the devil in thinking that our faith should only be centered around the joyful, not the uncomfortable. It’s in the uncomfortable that we find our human nature. We find the REAL Jesus and the REAL us. We become closer to Him when we decide to let it be done according to His will, as much as we may not like it. We walk a little closer to Him and see that He has much bigger plans for us than we can imagine for ourselves…if only we could break out of our comfort zone. I saw this quote when you posted it on Facebook and had to share it. It is one I had never heard before and so powerfully true. It is something we all need to hear when we are struggling. I could have written everything you said about discomfort. Also, I’m pregnant with my first and at 19 weeks I’m still having nausea (though the vomiting has – hopefully – gone away. I’m going to put post-its with this quote on every surface I see on a daily basis. Maybe it will help me stop whining and realize there are bigger things than my relatively minor discomfort. It’s tough, Kelsey! Prayers that you’ll feel better and be able to keep your eye on the prize! i TOTALLY love this post! we are not made for comfort… the thought is so radically different from our culture. 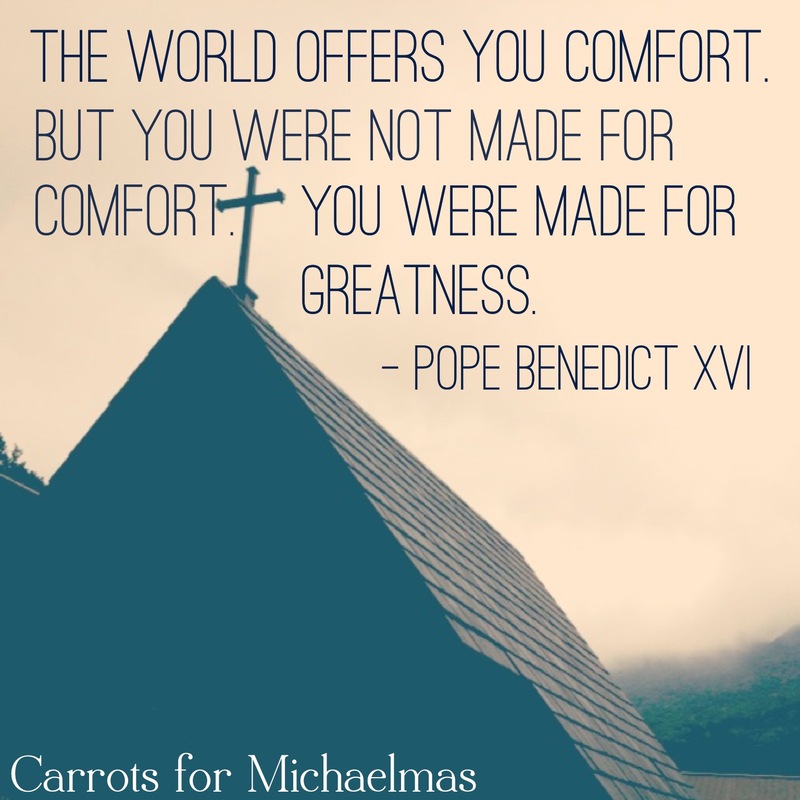 we are not made for comfort… i find this thought exciting and strangely comforting! i feel like i must be doing something right after all! thank you for this beautiful post! i will be giving it must thought and reflection in the coming weeks. on a different note, you might find this site helpful.